For Day 3 of my "Christmas In July" post, I know that I can't mention Christmas without mentioning the Navity Story!! And the best way to talk about is through artwork that my son had done in his specialized Sunday School class at our church! For those who are new to my blog, I am mother of a child living with Autism but we have are fair share of joys and victories during the course of our journey together! 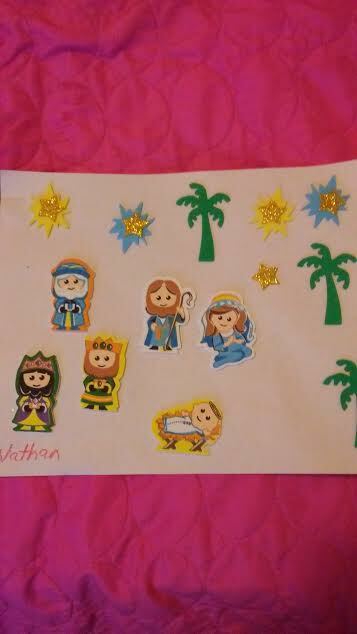 My son LOVES Sponge Art Stickers and the teachers in his classroom were able to find these Nativity theme stickers which had stars, the three (Kings) Wisemen, Joseph, Mary, and of course Baby Jesus in the manager!! My son has known this Christmas story and the True Gift of Christmas ever since he was a baby, since he was able to say "Baby Jesus" and point to the Baby in the pictures, and now smiles and mentions "Christmas"!! Thank you, Rae!! I am continuing my "Christmas In July" theme now until the end of this month! !